A discussion about Sydney’s violent protests tonight, which was to have been presented by a controversial Muslim sheikh, has been cancelled amid mounting pressure and media attention on parts of the Muslim community. The controversial Sheikh Feiz Mohammed, Sheikh Khaled Issa and other members of the Ahlus Sunnah wal Jama’ah (ASWJ) group were going to present a seminar at the Bukhari House in Auburn this evening to talk about the weekend protests, the anti-Islamic YouTube film that has sparked demonstrations around the world and “our responsibilities regarding this matter”. After days of damage control within the Muslim community, ASWJ anounced this afternoon it would no longer stage the event. 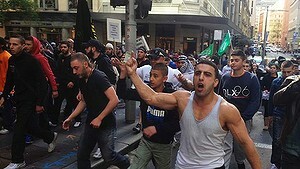 The announcement to cancel the lecture came just hours after after the controversial Islamic group Hizb ut-Tahrir encouraged “Muslims to continue in their noble work” and hit back at criticisms against Sydney’s violent weekend protest by blaming an anti-Islamic agenda from media and political opponents. Hizb ut-Tahrir’s Australian chapter issued an eight-point statement this morning that is likely to inflame tensions in the already-delicate situation following Saturday’s protests.